The whole point of us spending the entirety of our younger years working and earning moneyis so that we can save enough for our later years when we will not have as much energy to work. This is why this period is referred to as retirement. It is especially important to have better control of our finance when young because as we grow older, the levels of financial insecurity increase. This basically means that we will not have the same opportunities to make money as we have today. Here are 4 tips to help you maximize on your savings especially during your younger years. Most people confuse emergency money with savings. In many situations, you have had to tap into your savings when faced with a family emergency that required a large amount of money. More often than not, once you have used up this money, you are never able to replace it thereby depleting your savings accounts. It is therefore important to plan your finances in a way that you set aside money to finance emergencies without having to tap into your savings money. If you are lucky to work in a company where your employer offers a matching 401(k) program, you had better go for the maximum amount allowed. This is an investment with one of the best returns because you get to almost double your money instantly. In the event your company does not offer a 401(k), then look for an alternative savings plan which allows your savings to grow on a compounded interest basis. You must make it a habit to plan for your large expenses way in advance. For instance, if you intend to spend on a house, a car or college tuition, this is an expense you should plan for at least 12 to 18 months in advance. You should also ensure that this is not money that will be spent from your savings or emergency allocation. ROTH IRA is basically an individual retirement account which allows you to make contributions after tax. This basically means that you can access your money at any time without incurring a penalty. When you are at the retirement age of 60 years, all your withdrawals will be tax exempt. However, it is important to do sufficient homework with regards to this option because there are a number of requirements such as income eligibility limits which have to be adhered to. All in all, the earlier you start taking advantage of these savings options the more the returns will be, and the happier your retirement will be. The reality of economics is that at some point in your life, you will be forced to borrowmoney in order to be able to achieve certain milestones such as owning a home, a car or even doing an MBA in order to get a promotion at work. Your spending habits will ultimately dictate your ability to borrow. We take a look at 5 ways to improve your borrowing power. By now you are aware of what a credit rating is therefore we won’t go into the nitty gritty of it. Basically, the better your credit rating, the better your chances of securing finance from a lender. Your credit rating is mostly determined by your debt settling history therefore you have to ensure that all your utility bills, credit card bills and all other bills are paid on time. This will ensure that any lender who looks at your credit report does not see any potential red flags. Before any lender can give you money for any purpose such as a mortgage, a normal loan or an auto loan, they will first seek to find out how much debt you currently have. Therefore, the more money you owe, the lower your chances of securing financing. Make it a habit to pay off your debts promptly and never let them accumulate. You will be in a better position to access money from lenders if you have very few or no debts. Before any lender can give you access to finance, they will want to assess your ability to pay them back. This means that they will look at your spending habits and try to identify any pattern that presents as a red flag such as borrowing to settle any of your outstanding bills. It is therefore important for you to lower your expenditure and ensure you are living comfortably within your means. The more your income, the higher your chances of securing finance from any lender. Therefore, if you know that at some point in your life you will need to borrow money for a big project, make it your goal to increase your income. You can do this through fighting for a promotion at work or starting a business to supplement you income. Having organized accounts is especially important for people who are self-employed. As a rule, before any lender gives you access to their finance, they will require a statement of your account for the past at least two years. The more consistent your income, the higher your chance of securing financing. Having your accounts organized is the only way you can demonstrate consistency in income. Be sure to borrow only if very necessary. One of the most assured ways of achieving your long term financial goals is investing your money. This is especially true if you start early in life. Investing goes beyond just having a savings account, or a retirement plan, rather it extends to investing in stocks, bonds, bills and other financial securities. Let’s look at the 5 benefits of investing money. One of the obvious realities about life is that the older you are, the lower your income generating opportunities. This basically means that when you will get older, your opportunities to make money will diminish. It is therefore important to invest especially early so that by the time you can no longer work, your investments guarantee you a regular income such as through dividend, company stocks, treasury bonds or bills. In as much as different investment options carry an element of risk, the potential for long term returns is usually high. To simplify it, if you hold on to your cash for 10 years, its value will more or less be the same down the line. However, if you put this cash in a good long term investment, you are guaranteed that 10 years down the line, this money will have increased by at minimum 50 per cent. When you invest your money in a good venture, it guaranteed to increase annually at a percentage that is significantly higher to the inflation percentage. This means that your investment will cushion you every year from the economic effects of inflation. In economics, it is given that your financial situation will change from time to time. You may not have as much spending power 10 years from now as you do now. Investing will help cushion you from such eventualities. Starting to build your investment portfolio early will help grow your financial reserves which you can tap into when your regular reserves take a hit. Investing does not have to be for the purposes of retirement. You can establish an investment portfolio that is targeted at different financial objectives. The whole point about investing is so that you can grow your money therefore you can set targets such as buying a home, buying a car or going on vacation, and establish an investment plan on how to achieve these objectives. Ultimately, the earlier you start investing, the more time you will get to learn the art and perfect it thus increasing your chances of getting a much higher payoff. No one can deny that credit and debit cards have made life much easier and brought a lot of convenience in the way we do our day to day transactions. However, much of this convenience still does not outweigh the benefits that came with cash transactions. Here are 6 advantages of using cash. In as much as credit and debit cards are popular among many vendors, it is worth noting that no all vendors accept them. However, no vendor will turn you away if you have cash. There are vendors who still want to touch and feel money, or some who feel that it’s not necessary for their businesses to incur the extra cost of equipment to handle credit or debit cards. When you use credit and debit cards, you will often incur an extra cost over the transaction cost. Some call it a service charge or transaction fee. However, cash transactions will always be free. You pay for exactly the service you received, nothing more nothing less. Unless of course you are a good tipper. The beauty about cash is that you can only spend what you have with you at the time of doing the transaction. This means that it is much easier to stick to your budgets. The same cannot be said for credit and debit card holders who have historically been known to exceed their planned budgets. Many people never really think about it but dealing with cash actually improves your math. The fact that you have to keep on physically counting your money in order not to make mistakes while making payments will improve your arithmetic. Many people today are struggling with credit card debts because credit cards grew shifted from being a convenience into a debt trap as a result of people spending money they do not have. However, when it comes to cash, the fact that you can only spend what you have means the probability of buying what you cannot afford reduces hence reducing your chances of falling into debt. The good thing about cash is that before you spend it on something, you will always look back at how much time and effort you had to put in order to make it. This makes you think twice before spending your money on something that is not worthwhile. Such habits make you more financially responsible. At the end of the day, the choice of whether to use cash, credit or debit card is usually down to an individual’s own preference. We all know that college education is expensive. It is for this reason that currently college debts rank as one of the highest reasons for debt among young people under the age of 30 years in the United States of America. Millions of college students are graduating and entering into the job market but spend a better part of their early working years paying off their college debts. The unfortunate bit is that when these students were signing up for these loans, they never had a game plan on how they were going to finance them. In fact, they didn’t think through about the ramifications of taking out these loans. 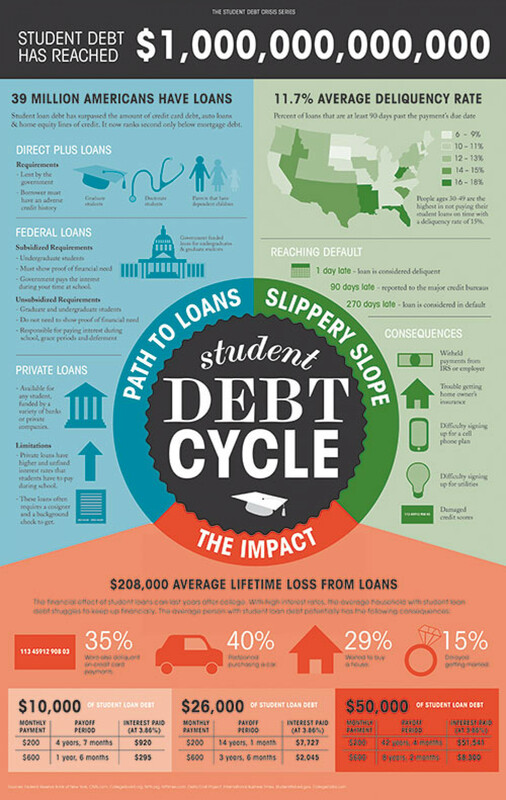 Well, before you take out a college loan, here are the dangers you should be aware of. Student loans are generally treated like any other type of loan therefore, when a person defaults on them, it will ultimately negatively impact their credit score. As you may be aware, a low credit score damages your chances of being able to access credit in the future. A recent article published by CNN revealed that 34 per cent of companies in the United States of America perform credit checks as part of their background checks on potential employees. A history of defaulting on your payments may therefore give potential employers a negative impression about you and this may ultimately deny you a job. Think of it this way, if you accumulate too much debt in student loans during your under graduate program, and you cannot figure out how to pay off the debt, you will definitely not be able to afford to pay for your graduate school. It will be ill-advised to consider taking another loan at this time to finance grad school. Most people aspire to become successful and financially secure in life. This is a goal that most students have when they graduate and hit the job market. However, with a large college debt on your shoulder, most of the money you will be making will be going towards debt repayment and this will affect achievement of your life goals. It will take much longer for you to achieve financial independence and raise your standard of living therefore taking much longer for you to realize your life goals. As a student, it is advisable to think very clearly with a clear mind before exposing yourself to the nightmare of college debts. It is said that prevention is the best medicine. This is true especially in economics and to be more specific debt, in that the best way to avoid falling into debt is by not letting the debts accrue in the first place. The reason we mostly fall into debt is because we mostly need to borrow money in order to be able to finance certain necessities such as our mortgage, car payments and education among others. It is often close to impossible to pay for such necessities in cash. We take a look at 7 easy tips on how to avoid falling into debt. 1 Try as much as possible to pay in cash: Paying in cash ensures that you spend within your budget. After all you can’t spend cash that you do not have. Therefore to avoid living beyond your means, try as much as possible to limit yourself to cash transactions. 2 Avoid impulse buying: Part of the reason most people accumulate credit card debts is because they spend money on unnecessary things mostly in the spur of the moment. It is important to nurture adherence to budgets so as to avoid impulse expenses. 3 Avoid sales traps that encourage debt: There is a tendency by most people to fall into sales traps that result into debt such as “buy now, pay later” retail offers. Such purchases end up accumulating thereby increasing your debt. 4 Do not borrow to spend: Never at any time develop a habit of borrowing money to spend on essential products. These are the kinds of products you will need regularly therefore you should use your income and not borrowed money. Borrowing to finance staple purchases is most definitely a journey into debt. 5 Go for the best offer: As we have established, sometimes you have to borrow in order to finance certain purchases. Therefore, if you must borrow, ensure that you find the lender who offers you the lowest interest rate as well as accompanying fees. 6 Monitor your credit card: Credit cards are arguably the most common source of debt currently. It is therefore important for you to closely monitor your credit card payments and keep tabs on all your purchases so that you do not spend beyond what you can afford to pay back. 7 Settle your credit card bills: There is a tendency by many people to just make the minimum payments on their credit card yet their expenditure is much higher than the minimum. This will ultimately lead to accrued bills which will lead to debt. Make it a habit to settle your entire credit card bill so that as you spend, you are doing it on a clean slate. There you go. Do this and you will thank us later. No one wants to live their life knowing they owe someone or a creditor money and that this person or creditor can come at any time to repossess their things in order to recover their money. This is certainly not what people have in mind when they allow their debts to accrue. Such eventualities may lead to an emotional roller-coaster for both the person and their families. We explore 4 negative effects of debt in your life. This is especially true for a person with a family. We all know that one very sure way of reducing your debt is picking up an extra shift at work or getting a second or even third job. What this means is that you will be spending your entire day and even night working in order to get extra cash to pay of your debts thereby keeping you away from your family or finding time for your own relaxation. Such scenarios negatively affect your life and even well being. When most of your income is going into the repayment of debts, you won’t be left with enough to put aside for emergencies, savings or retirement. In some cases, you may be forced to dip into your savings so as to settle accrued debts. This is not the kind of life you want to live, whereby you and your family are not cushioned against emergencies or any other eventualities. Often, when you are neck deep in debt, and you don’t have a feasible way out, chances are that you will likely dig yourself further into debt because you simply have no option but to continue surviving. It is therefore important to do everything within your power for the sake of yourself and your family not to fall into debt or not to let debts accrue. The longer you wait to start paying off your debts, the harder it will become to repay them. A number of states in America have permitted garnishing of a person’s wages to recover unpaid debts. Current statistics indicate that credit card debts and student loans are currently part of the top three reasons for an employee’s docked wages. This is after child support and tax liens which top the list respectively. Exposing yourself to this may have serious implications on your budgeting. In life, it’s always important to have a financial plan for your future, for your sake as well as for your family’s sake. With a plan, you will ensure that you make better spending decisions that will ensure you never fall into the debt trap. Most people don’t understand the effects on inflation on their finance. In fact, they will never notice the effects of inflation until it is probably too late to do anything about it. Inflation will generally lower the value of your money as the prices forconsumer products go up. This means that for an investoryour future dividend and interest payments will not be as valuable as you had anticipated. However, there is good news. You can actually proactively protect yourself from the effects of inflation. Here are 5 tips on how to go about it. In economics, the best way to protect your money from losing its value as a result of inflation is to invest it in real assets such as property, gold, agriculture and eveninfrastructure. These are markets that usually perform well especially during times of inflation because they continue to rise even as inflation rises. During times of inflation, people lose money on their investments because they did not get a good interest rate that is high enough to protect their returns from the effects of inflation. It is therefore important for you to ensure that you have done the math to ensure the interest rate you get is sufficient to cover the eventuality of inflation. During times of inflation, borrowing means you will have to repay the money with a high interest rate. It is therefore advisable that if you have money available in your savings account, to use it as opposed to taking in debt to finance your expenditure. However, try not to spend all your savings or your emergency money, and be sure to refund this money into your savings account when things stabilize. One of the biggest victims of inflation are usually pensioners who are living on a fixed income. Their spending power will drastically go down owing to the rising prices of goods and falling value of money. It is therefore important to start building you retirement nest egg early in life, and ensuring that you maximize on any of the available savings options and offers such as employer matching options. This will ensure that by the time you get your retirement, you have more than enough set aside to cushion you from the effects of inflation. Be sure to take these simple measures and you are on your way to financial stability. In economics, inflation can be described as a sustained increase in the prices of goods and services in an economy over a period of time. The more the prices rise, the more money loses its value as citizens are able to buy fewer and fewer goods and services. Generally, there are two causes of inflation which we will look at below. This is the most common type of inflation which comes as a result of an increase in the demand for goods or services to an extent that this increase goes beyond supply. This usually gives sellers the opportunity to take full advantage of the laws of supply and demand by increasing the prices of goods or services thereby creating inflation. 1 A growing economy: When an economy grows, a large percentage of the citizenryalways end up having more money to spend thereby creating more demand for goods and services, than the market can supply. 2 The Federal Reserve: As a way of managing the public’s expectations with regards to inflation, the Federal Reserve will set inflation at a certain percentage as a way of protecting consumers from the seasonal increases in the price of goods and services. 3 Discretionary fiscal policy:The government usually has the discretion of spending more or taxing less and this will result in an increase in demand incertain sectors of the economy. 4 Marketing and new technology:In this technology driven world, the desire by large sections of the population to acquire new technologies which have been marketed as must-haves results in a huge increase in demand which brings about inflation. 1 Wage inflation:This means an increase in salaries which is very rare in an economy unless there are very active labor unions. 2 Monopoly: When there exists a company that has the ability to create a monopoly in the market then it creates a cost-push inflation. However this was outlawed by the Sherman Anti-Trust Act of 1890. 3 Natural disasters:When disasters occur that damage production facilities then this results in a temporary cost-push inflation. 4 Government regulation and taxation:In some situations, government interventions through regulation and taxation will impact the market in a way that results in inflation. This may sound like a little bit jargon especially for people not familiar with economics but it becomes pretty easy stuff when you get a grasp of it. In economics, every once in a while we are faced with monetary realism and we find ourselves questioning different factors like where does money get its value from? Or how does society learn to trust these pieces of paper or coins as mediums of exchange? It is during these times that it becomes helpful when we break this demand for fiat money into the two main components which are acceptance value and quantity value of money. Let’s break it down below and make some sense out of this. The acceptance value of money is essentially the public’s willingness to accept a specific form of currency as their country’s main medium of exchange and unit of account. In most cases, this is usually achieved through a legal process however this has been challenged in recent history with the emergence of crypto currency which has been highly unregulated.Ultimately, it is the duty of government to regulate monetary systems within which money is utilized but at the same time, government cannot force its citizenry to accept this money as the only acceptable medium of exchange. The quantity value of money is essentially the acceptance of a specific form of currency in terms of its purchasing power, production value,inflation, and exchange rates among other factors. Unlike the acceptance value of money which can be enforceable by law, the quantity value of money tends to be somewhat unstable and has the potential to result in a monetary collapse. All-in-all, the physical notes and coins we use as cash, in themselves don’t have intrinsic value however, they serve as an acceptable medium of exchange that the citizenry is comfortable to use in exchange for various goods and services that they need. It is therefore the responsibility of government to ensure that there is a fully functioning banking system too oversee distribution of the money as well regulation of its usage. If this is not in place, a country’s monetary system stands the risk of collapsing.